Cloning. Once upon a time a pipe-dream-made-reality with Dolly and though morally problematic, once in a while we get another movie about cloning humans. Spoiler alert: they never end well. The latest is Katie Fleischer's feature film debut Patient 001 which stars Rosie Fellner as Josie, the loving wife of a man in a coma. She's desperate to have a baby but for reasons which aren't explained in the trailer, she's unable to proceed with artificial insemination. Enter Dr. Jameson (Michel Gill) who offers to clone Josie's husband in secret. And then Josie's husband Leo wakes up from the coma. Major drama that gets worse when it turns out that he and the baby have violent reactions to each other so they do what any loving parent would do: they dispose of the baby. Fast forward 23 years to a mysterious stranger who turns up at their door. Bet you can figure out what comes next. It's a ridiculous set-up but I must admit I'm really curious to check out Fleischer's movie. The trailer plays like an over-dramatic thriller that's trying to get at some big questions (do the clone and the donor share a consciousness?) but something about it nips at my love for cheese made-for-tv thrillers. 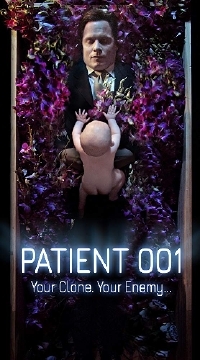 Patient 001 is available on VOD February 5.